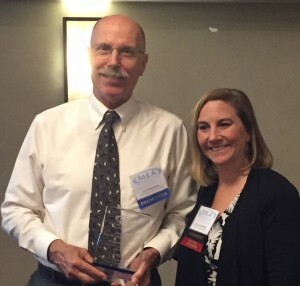 California State University, Northridge marketing professor Curt Dommeyer has been honored with the 2018 Lifetime Achievement Award from the Marketing Educators’ Association (MEA) for his 39 years of dedication to advancing the practice and scholarship of marketing education. Dommeyer received the honor in April for his long-term contributions to MEA and his mentoring of marketing students and faculty in conducting empirical research. His efforts have resulted in the co-authorship of papers with 41 undergraduates and four graduate students. The publications with the 45 students resulted in about 20 papers or presentations. Letters of support came from CSUN marketing professors Mary Curren, David Ackerman and Bruce Lammers, and former marketing professor Brian Connett. They described Dommeyer’s years of generous effort, challenges and teaching methods he used with students. He also received a letter of support from CSUN marketing student Michael Bessolo, who wrote about Dommeyer’s influential and inspiring impact on his academic career. As a member of MEA, Dommeyer authored four articles in JME. He also made 20 presentations of refereed papers at MEA conferences, was a manuscript reviewer and served on MEA’s board of directors for two years, was a conference discussant on several occasions and chairperson. He currently serves as the JME Ad Hoc Reviewer of Manuscripts. For more information about MEA please visit their website.